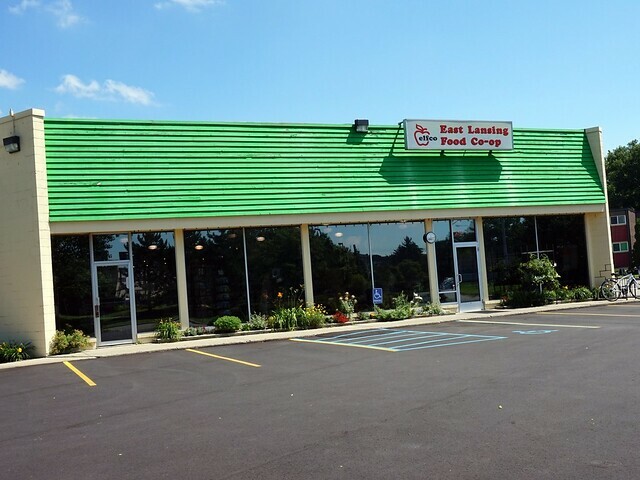 Roadtrip 2014 Begins – Fort Custer Recreation Area – vegan in your city. J and I have been planning a bit of a road trip for a couple of weeks, and now we’re actually doing it. The exciting and daunting thing about embarking on this sort of thing is that we’re not planning on being back home for quite a while. Thankfully we have some incredible friends and family that will make sure our furkids are okay while we’re away. We’ve already turned on the kitty cat spy cam a few times – because leaving them behind is easily one of the hardest parts of travelling. 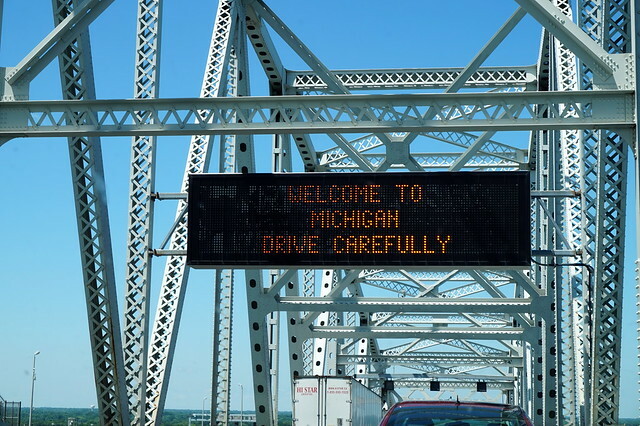 Before we left Toronto we picked up a box of our traditional Through Being Cool roadtrip treats, turned on an Animals Voices podcast, and were on our way – first stop the Blue Water Bridge border crossing in Sarnia into Michigan. Border Crossings can be such a mixed bag, but while this one had a very long line, it was one of the more pleasant crossings I’ve had in the last couple of years. The most incredible thing about the crossing, is that they’re not kidding about the blue water. It’s so blue and looks so lovely from the bridge, so while you’re waiting you get to see a beautiful vista. 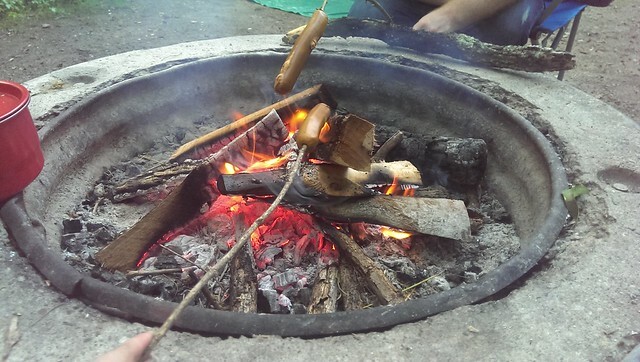 After putting up the tent we built a fire, roasted Tofurky dogs, and cooked up some pretty basic soycurl chili. JC and I took a walk through the forest, and saw wild turkeys running around, and I saw fireflies for the first time ever (& someone else in the forest called them lightening bugs.) It was exciting to see those brief flickers of light in the trees as we sat by the campfire as dusk rolled through. On the way to our campsite we stopped in East Lansing to buy a couple of things at the East Lansing Food Co-op. It has a whole bunch of produce and other vegan specialty foods and breads. While you’re at it, you can take a peek at their fantastic community garden nearby. We went to sleep under a cloudy starless sky and were woken up by to sound of rain hitting the outside of our tent, but it was really lovely to sleep out in the open air, it’s been at least four years since the last time I was able to do that. The next day would be JC’s birthday, and we’d be getting back on the road and on to our next stop – Chicago. From Vegtastic Voyage – The Campastic Category – grateful for her post on bringing soy curls. It doesn’t take up that much space, but it adds a lot to the meal. An oldie but a goodie from Vegan Backbacker. We will be doing some more camping over the next few weeks, so hopefully will have more useful information and pretty pictures to share along the way. 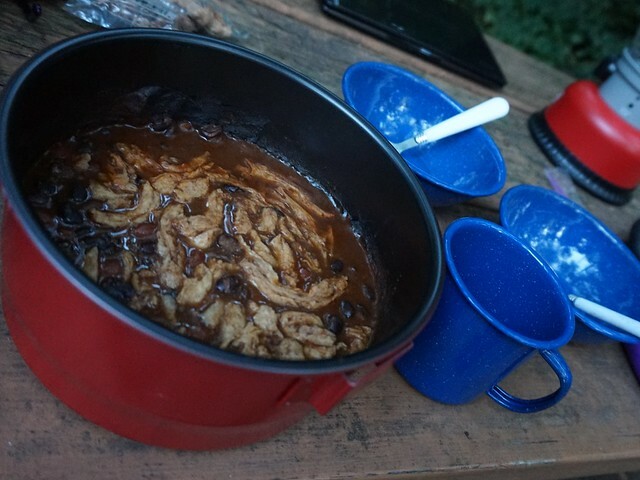 What is your favourite vegan camp food? 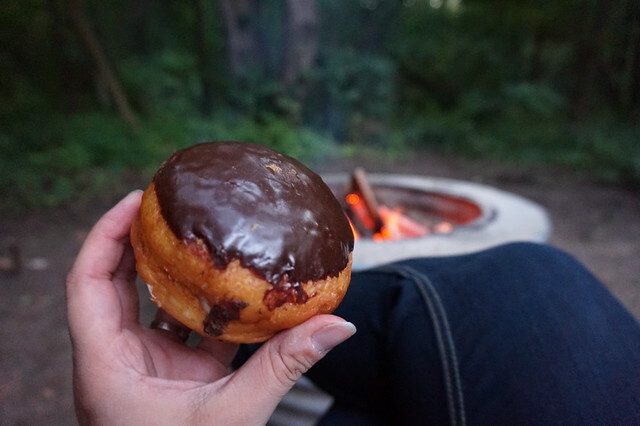 Camping, Fort Custer, State park, Vegan Camping. Bookmark.